The existence of systemic disease potentially worsens the quality of life of the elderly associated with dental caries. Some studies suggest that people with diabetes, hypertension, and coronary heart disease have the worst quality of life than people without systemic disease. Therefore, special attention is needed to elderly people suffering from systemic disease with high dimethyl fumarate value, so that there is a need for community empowerment to increase the knowledge toward systemic disease relationship with oral and dental health. Community empowerment is a process to improve the ability or capacity of society in utilizing the resources owned: human resources and natural resources which were available in the environment to improve the welfare of life. However, efforts are made not only to increase the capacity of the community to meet their needs but also to build a sense of community self-sufficiency to develop and have a strong motivation in participating in the empowerment process. Society, in this case, becomes the perpetrator or center of the empowerment process. The existence of several kinds of diseases that have a direct correlation is caused by focal infection. Focal infection is caused by a chronic infection somewhere, in which the tooth becomes the origin of the cause of systemic disease development. The existence of a correlation between systemic disease and dental caries causes the elderly to be more aware of the importance of their oral health, so that the quality of life of the elderly remains good. The goal to be achieved from this empowerment program is to create an independent society. Such independence includes the independence of thinking, acting, and controlling what they do. Furthermore, it should be explored what is actually interpreted as independent society. This empowerment aimed to provide knowledge about systemic disease correlation with oral and dental health to the cadres to convey information to the elderly group. Ethical approval for doing this study has been obtained from the Research Ethics Committee of the Faculty of Dentistry, Airlangga University (No. 151/HRECC.FODM/VIII/2017). This study uses the total sampling method. counselling with the lectures is done by explaining the materials to the cadres, followed by a question-answer. This lecture is aimed to provide knowledge about systemic disease and It's correlation with oral and dental health. The evaluation was done by the questionnaire and observation. The questionnaire was given to the cadre before the counseling started as a pretest and was also given after counseling as a posttest. This questionnaire was used to observe the knowledge of cadres before and after counseling. Observations were also conducted on the cadres by asking the cadres to represent the extension workers. This was done to observe the ability of cadres in delivering socialization materials to the elderly. Assessment of cadre observation was done with the checklist. Subsequent evaluations were carried out when the cadres counseled the elderly in the nursing home. The success of the cadres is seen from the post test result of the elderly after given counseling by cadres. All the respondents who were the subject in this study had filled the informed consent that stated their willingness for intraoral examination and filling questionnaire. The program began with the selection of peer cadres from the nursing home. After the cadres were selected, a pretest was carried out to assess the cadre's level of knowledge. After that, cadres were given material about dental and oral health, as well as systemic disease and It's correlation with oral and dental health. Posttest was carried out to observe the cadre's level of knowledge after counseling. If the value obtained by the cadre is in accordance with predetermined standards, the cadre has graduated to be able to conduct counseling to other elderly people in nursing homes. The level of knowledge of the elderly was examined by the questionnaire. The questionnaire used in this study had been tested for its validity. 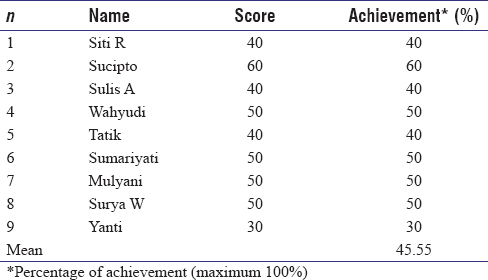 The validity test for the questionnaire was done by finding a correlation between the scores of each question (r result) with the r value. The validity test was done twice until all the questions were considered valid. To be declared valid, all questions must have a positive r value and value >x. The results of the validity show all valid questions. There was an increased knowledge of cadres after counseling. It can be seen that there was an increase in posttest average when compared with pretest [Table 1] and [Table 2]. After counseling, the cadres delivered the material given to the extension agent. This was to observe the delivery of extension materials by the cadres before each cadre went to the care center to provide counseling to the elderly [Table 3]. Furthermore, the evaluation of the ability of cadres in giving counseling at care center by looking at the elderly knowledge about the dental and oral health submitted by the cadres was performed [Table 4]. The achievement of success regarding health promotion activities about counseling of systemic relationship with health of oral cavity in the elderly was high. This can be seen from the cadre understanding of the material delivered during the counseling obtained by looking at the percentage of pretest and posttest cadres. Obtained average knowledge of the elderly before counseling was 45.55%, which can be seen from the value of pretest. The cadres were very enthusiastic about the material given during the counseling; the cadres also gave some questions about extension materials to extension workers. The average (mean value) of posttest achievement of the cadres after giving counseling is 77.55%. It can be concluded that there was an increase of cadre knowledge after counseling. The result of observation of the cadres in the resubmission of the material was quite good, almost all the cadres could deliver the materials to the extension agent with the mean value of achievement is 84.52%. Subsequent evaluations were carried out when the cadres counseled the elderly in the nursing home. The success of the cadres is seen from the post test result of the elderly after given counseling by cadres. The evaluation was conducted on four elderly nursing homes around Jagir Health Center. The nursing home used in this study is only 4, this is due to the limited time of research so that researchers couldn't visit each existing nursing home in the area. The selection of those nursing home was based on the willingness of the nursing home as a research subject within the time period. Obtained average understanding of the elderly to the material delivered by cadres in care center was 71%. This indicates that the elderly understood with the material delivered by elderly cadre. The advantages of this empowerment program were the material of counseling according to the elderly condition around the Jagir Puskesmas area which on average has a systemic disease. The target of this empowerment program was a cadre from the elderly nursing home, where the cadres were trusted by the community, so that the delivery of materials to the elderly was more effective. The downside of this empowerment program was the overload of material delivered in a short time. This caused the elderly to be not able to comprehend the material to the fullest. Opportunity gained in the running of this empowerment program was the high attention of the elderly in maintaining physical health and oral health. This had a positive impact on the elderly enthusiasm in this empowerment program. People aged 65 years and over, for instance, are less likely to smoke, drink alcohol, or report high stress. They eat more sensibly than do younger adults, are as likely to walk for exercise, and more likely to check their blood pressure regularly. That is why older adults continue to increase their rate of participation in medical screenings and immunization; they seem to have more concern in their health. Difficulties or threats to this empowerment program was that this program empowered the elderly, where special methods are needed to deliver material so that they can easily receive the material. Based on the results of the evaluation, it can be concluded that oral health education, especially about systemic disease and its relationship with oral health, in the form of counseling method to elderly nursing home cadre was effective. And if these cadres was able to deliver these information to the elderly, then the knowledge about systemic disease relationship with oral health in the society of elderly group could increase. Based on the results of the evaluation, it can be concluded that dental and oral health education in the form of counseling systemic relationship with oral cavity of elderly with lecture counseling method to Elderly Nursing Home cadre was effective in delivery of information to elderly so that knowledge about systemic disease relationship with oral cavity in society of elderly group could increase. The Department of Dental Public Health, Faculty of Dentistry, Airlangga University. Rubin RR, Richard R. Diabetes and quality of life. Am Diabetes Spectr 2000;13:21-3. Swastini IG. Tooth Damage is the Focal Infection Cause of the Occurrence of Systemic Disease. J Kesehatan Gigi 2013;1:63-8. Haber D. Health Promotion and Aging: Practical Applications for Health Professional. New York: Springer Publishing; 2013. Kaplan RM. Behavior as the central outcome in health care. Am Psychol 1990;45:1211-20. Kane RA. Long-term care and a good quality of life: Bringing them closer together. Gerontologist 2001;41:293-304. Tajima T, Saito Y, Kato R, Kibayashi Y, Miyachi M, Lee IM, et al. Awareness of physical activity promotion, physical activity, and sedentary behavior in elderly Japanese. J Phys Fit Sports Med 2018;7:113-9. Li W, Procter-Gray E, Churchill L, Crouter SE, Kane K, Tian J, et al. Gender and age differences in levels, types and locations of physical activity among older adults living in car-dependent neighborhoods. J Frailty Aging 2017;6:129-35. Asp M, Simonsson B, Larm P, Molarius A. Physical mobility, physical activity, and obesity among elderly: Findings from a large population-based Swedish Survey. Public Health 2017;147:84-91. Lindsay Smith G, Banting L, Eime R, O'Sullivan G, van Uffelen JG. The association between social support and physical activity in older adults: A systematic review. Int J Behav Nutr Phys Act 2017;14:56. Gullota TP, Bloom M. Encyclopedia of Primary Prevention and Health Promotion. New York: Springer Science and Business Media; 2003.